Just outside our place here in Gordon’s Bay, in the wee patch of grass where our little one likes to run, squeal, and use his “outside voice” there is a beautiful bush that seems to never want to stop flowering. He calls it the “Taco” (his mother speaks Spanish to him occasionally) but the bush’s actual name is the Tecoma. 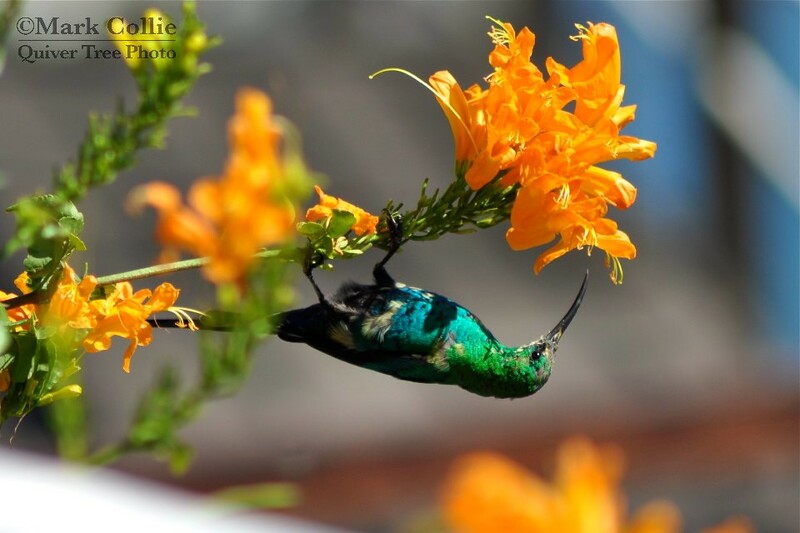 South Africa is home to lots of absolutely gorgeous birds (and some pretty awesome flowers), and this sunbird, (I think it’s a Malachite Sunbird) and its friends were teasing me for quite some time — coming to enjoy the Tecoma bush and then skittering off before I had a chance to grab a shot. Eventually they decided to stick around for a little longer, and I managed to capture this happy fellow busy in a beautiful balancing act. My wife would like to use his luminescent bright colours as inspiration for some interior decorating some day!